Crucial, the retail arm of Micron, has been selling DDR4 memory at its US store for a while now. Though not present in the UK webstore at the moment, various Crucial Ballistix modules can be purchased this side of the pond through enterprising retailers. The company doesn't claim to the be the first to market with cutting-edge DDR4 - we have yet to see anything quicker than 2,400MHz on the Ballistix line - but has a well-earned history of reliability and customer service. And with the Intel X99 platform the only one using the new memory for now, one that isn't partial to higher speeds, purchasing well-priced DDR4-2,400 remains a sensible choice. 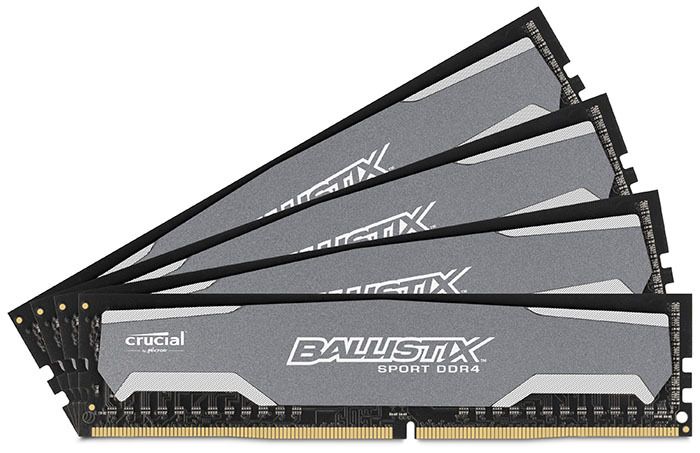 Playing on this value-performance theme is a 16GB (4x4GB) pack of Crucial Ballistix Sport DDR4-2,400. Identified as part number BLS4K4G4D240FSA and available for $299 in the US and £199 in the UK, the quad-module pack is specified with 16-16-16 latencies. The pricing is consistent with other manufacturers' DDR4 rated at the same speed and timings. Crucial's styling department has it spot-on with these modules. Purposefully weighty and looking attractive through the use of a black PCB contrasting well against the gunmetal-grey finish of the heatspreaders, the modules are of standard height and therefore fit in easily underneath the larger coolers used on an X99 platform. Are heatspreaders really necessary on memory of this ilk? We'd say no, because the modules barely get warm to the touch after extended use, so, like every other memory guy on the market, it's a case of style over substance. Build quality is excellent though we would like the sharp edges smoothed a little. Installing them into some motherboards, particularly with the cooler in place, requires significant force to be exerted on the edges, leading to painful fingertips. A 32GB pack (8x4GB) is also available for those who want to maximise capacity on Intel's leading consumer platform, and it is one reason why Crucial chose to keep the speeds conservative - there are very few kits and boards that run all eight DIMMs at super-fast speeds. The heatspreader is the same on both sides. Modules are notched in such a way as to guarantee they can't be installed incorrectly. Interestingly, they're natively programmed at 2,400MHz speeds, not 2,133MHz as we have seen on other DDR4. Examining how they are setup by Crucial further, both the XMP 2.0 and JEDEC settings are broadly the same - 2,400MHz - and work off a standard 1.2V. Sub-£200 pricing for a 16GB pack is key if DDR4 is going to appeal to the 'value-conscious' X99 buyer. Crucial hits that mark, just, with this Ballistix Sport pack.